Bowing and falling on the face. From kneeling, to bowing, and then to falling on the face seems to be a three phase response and progression of our penitence and worship. The act of kneeling may be a premeditated and consciously chosen act; however, then as God works on the heart, the second and third phase of bowing and falling on the face is an act chosen without any effort. It may be more of a response. It is a willing movement of the soul being drawn down, even gently pushed down by the loving Spirit of God. Oh yes, God does help us in prayer. He does move us and steer us, even bring us into the appropriate positions. We are helpless to worship at all without Him. The above story shows that the people did indeed have a great awe of the power of God, but perhaps less of gratitude. However, there is a story in 2 Chronicles 20:14-30, where the people no doubt respond with both wonder and gratitude. In this story, when the people of Israel were greatly outnumbered by an invading army (the sons of Ammon and Moab and Mount Seir), a prophet named Jahazel relayed a message from God that they need not fight at all, but just to station themselves and watch and see the salvation of the Lord. King Jehoshaphat was the first to bow his head with his face to the ground, and then all Judah and the inhabitants of Jerusalem fell down before the Lord, worshiping the Lord. I can imagine what great relief and gratitude they felt when they heard this good news. And as it turned out, God did a great miracle that day causing the enemy armies to utterly destroy each other (v.23). I’m sure you can imagine the great pressure and grief Moses and Aaron felt. They had no where to turn but to the only one who could help. They turned of course to God who helped them several times before. And so, they, feeling quite desperate, came in from the presence of the assembly to the doorway of the tent of meeting, and fell on their faces. Then the glory of the Lord appeared to them (Nu. 20:1-6). 3. It is symbolic of a feeling of great earnestness. The Bible tells us that Elijah was a man with a nature like any other man, yet by his earnest prayer he stopped the rain on the earth for three years and six months, and then he prayed again and the sky poured rain (Ja. 5:17-18). But what we are interested in now is how that earnestness was manifested. We have a clue from 1 Kings 18:42. Here it says, “Elijah went up to the top of Carmel; and he crouched down on the earth, and put his face between his knees.” And there on that mountain top, alone with God, he prayed for rain. Notice his position—crouched down with his face between his knees. This is a position of great humility and also of great intensity of prayer. But we know from verse 41 that both his humility and his intensity in prayer were born from an absolute confidence that God had already begun the process of making rain; for Elijah heard “the roar of a heavy shower.” No doubt only Elijah heard this roar—as God opened his ears. And so I believe that out of an overwhelming sense of the reality of God, and of His great love for the people, Elijah was driven up to the top of the mountain. And there the hand of God pushed his face to the ground. Elijah was not begging God in prayer for an impossible situation, he was rather waiting with persistence and intensity for the rain that he knew would come. 4. It is symbolic of the feeling of a great burden. The best example of this is in Matthew 26:38-39. Here the Lord Jesus, near the end of His earthly life, went to His favorite place of prayer, Gethsemane; and being deeply grieved to the point of death…fell on His face and prayed, saying, “My Father, if it is possible, let this cup pass from Me; yet not as I will, but as Thou wilt.” This cup, which He knew He had to bare, was the sufferings for all of the sins of mankind, in addition to being separated from, and forsaken by, His Father—God (Matt. 27:46). He naturally shrank from this destiny, and was greatly grieved; thus the natural response was to fall on His face before God, the only one who could offer any hope. And hope there was, even great joy, as He knew that soon, after all the grief and pain, He would sit down with His father in glory (Heb. 12:2). 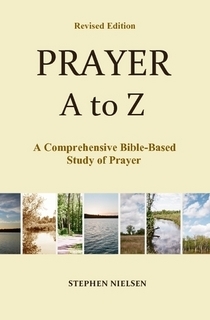 This entry was posted in Kneeling and Prayer, Prayer A to Z Excerpts and tagged prayer. Bookmark the permalink.